Day 81 – James H.
I heard from Roger D. today from Day 54…he is doing well. Still struggling but his positive attitude is inspiring. I hope to meet up with him this week. He is having some trouble figuring out how to get some medical/dental assistance. He is also still looking for counseling and a used lap top…if you haven’t checked out the Lend a Hand section, please do, maybe you can help someone today. If you have driven by the corner of Calvert and Connecticut in Washington, DC in the last 8 months there is a chance that you have seen the man on the right. This is James. The 39-year-old works for Street Sense. I try to find one of their salespeople each week because I just love the concept that the paper has and have really enjoyed meeting every single salesperson. James, vendor #315, got a job after his friend Randy suggested he apply. Randy used to work for Street Sense until he passed away in November of last year. The opportunity to help others is what drives James to go out six days a week to sell the newspaper that helps DC’s poor and homeless. Even on the coldest days, even in the rain, James is out there. He doesn’t let a lot stand in his way, not even a serious life-threatening illness. You see, James was born with spina bifida cystica (myelomeningocele). This is the most complex and severe form of spina bifida. In James’ case he was born with a hole in his back and part of his spinal cord and nerves were on the exterior of his body. Doctors operated and put everything back where it belonged, but it left him with some life long challenges, mostly related to his legs. 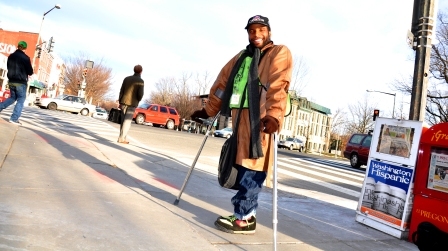 He uses crutches to get around, but can walk small distances without them he says. Throw away your Prozac and come down to Calvert and Connecticut Avenue in DC and say hello to James. Repeat daily for 6 days and you will be good to go!